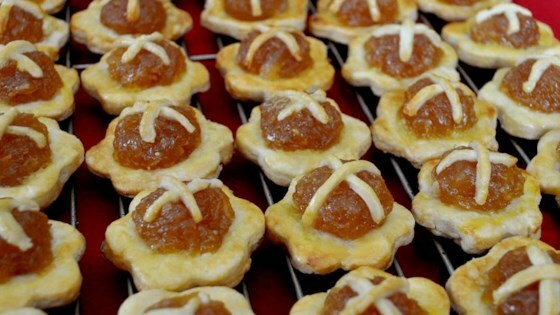 "Delightful little tarts with pineapple filling and a cross on the top." In a large bowl, combine all-purpose, self-rising flour and salt. Cut in butter until mixture resembles coarse crumbs. Make a well in the center of the mixture. Pour in 1 beaten egg and water. Bind the ingredients together gently. Do not knead too much. Shape dough into a ball, wrap in plastic and refrigerate for 4 hours or overnight. In a saucepan over medium heat, combine pineapple and sugar. Bring to a boil. Reduce heat and simmer, stirring frequently, for 30 minutes, or until mixture thickens. Remove from heat and allow to cool. On a lightly floured surface, roll the dough out to 1/4 inch in thickness. Cut 24 rounds, using a 2 inch round fluted cutter. Place on cookie sheet. Put a spoonful of pineapple jam in the center of each piece. Decorate with criss-cross strips of pastry over jam, extending slightly onto pastry shell. Cut 24 more 2 inch rounds, then, using a smaller cutter, cut out the centers, creating a ring shape. Moisten the edges of each pastry, and place the rings on top of each pastry shell. Brush the top of the pastry with beaten egg. Bake for 20 to 25 minutes in the preheated oven. Allow to cool on baking sheet for 5 minutes before removing to a wire rack to cool completely. Made with all purpose flour and 1 and 1/2 teaspoons of baking powder instead of self-rising flour. Wonderful! Not too sweet either. Thanks for posting Diana! This was a really good tart! I cheated and used premixed just-add-water pie crust, as well as canned pineapple but it was still phenomenal. Typo error in my earlier review. My apologies for that. I used plain flour only and added a little more butter.